The Friends of the Johnson City Public Library hold a spring and a fall book sale. The fall sale is the last weekend in October, and the spring sale is the last weekend of April. All sales are open to the general public, with a special preview sale for Friends members the day before. To enter the preview sale, just bring your Friends membership card or join at that time. 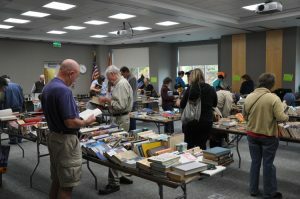 The Friends of the Library also hold an ongoing book sale, located across from the Circulation Desk at the front of the library. Payment for all materials purchased from the ongoing sale may be made at the Circulation Desk. Cash and cards accepted. Hardcover books cost $3, paperback books cost $1, DVDs and music albums cost $1, audiobooks cost $2, and children’s books cost $0.25 to $1 each.